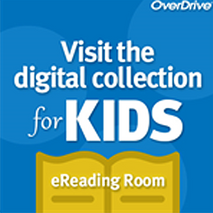 Overdrive Library2Go offers a wide variety of e-books and e-audiobooks for use on digital devices or your computer's web browser. 1. An app for a digital device such as an Apple Device, Android, Fire, Kindle Reader, Nook, or a web browser. A complete list of devices and instructions can be found at Overdrive's Getting Started site. 2. A valid library card to sign into the library's collection and check-out items. 3. Using the app on your device or a web browser, you can search, browse, place items on hold, and read titles. Visit app.overdrive.com to get started on your device and the Overdrive Help Center for questions and help with troubleshooting, or call the library's Information Desk at 701.241.1492. The Kid's Reading Room on Library2Go is also available at the Fargo Public Library. This collection is designed for kids 12 and younger with special tools for parents to search by reading level and interest level. All titles are also available in the main collection. Hoopla Digital offers e-audiobooks, movies, comics and music for smartphones, tablets, and computers. Visit your device's app store to download the app or you use your computer's web browser. Users will register for an account with Hoopla and provide their library card at registration. Please note: Hoopla is available to library card holders who are Fargo residents. The library card PIN requested is the same password you use to sign into the online catalog or Overdrive. 1. Download the Hoopla app or go to hoopladigital.com. 2. Log in with your Fargo Public Library card. 3. Borrow e-books, e-audiobooks, comics, movies, music and more. Visit the Hoopla Help Center with further questions on getting started and for help with troubleshooting. Call the library's Information Desk at 701.241.1492 if you need further assistance. The North Dakota State Library's E-Audiobook and Digital Magazine Collection is available at the Fargo Public Library. RB Digital offers e-audiobooks, e-books, and digital magazines for smartphones, tablets, and computers. By registering with the library's shared collection, you can find and check out e-audiobooks, e-books, magazines, and back issues (where available) and read them on your PC or mobile device using the RB Digital app. 1. Access the Fargo Public Library's RB Digital collection using your computer and browser to create an account. 3. Enter your library card and user information. 4. Accept the terms. Register. 6. Once registered, RBDigital will open to the Fargo Public Library's RB Digital collection homepage and available content will display. 7. Select MENU in upper left corner. 8. Scroll through and select a category for more content. View additional instructions for setting up RB Digital on your device. Tumblebooks is an online collection of animated, talking picture books, video and games for kids. Tumblebooks requires an active Internet connection and Adobe Flash Player. Because of these requirements, Tumblebooks is not currently available for mobile devices.